We've all known Figaro Coffee Company as one of the most popular coffee shops in the country. 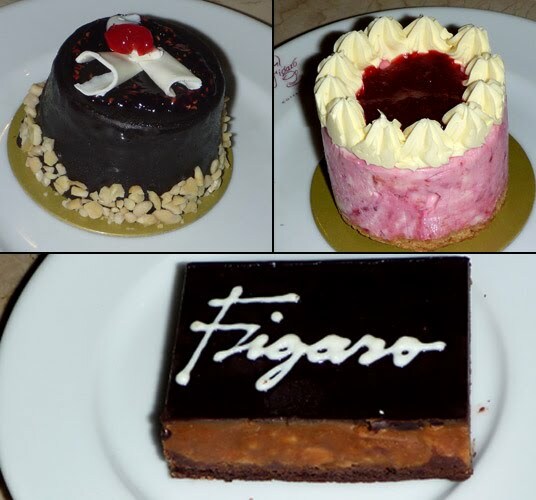 But did you know that there's more than just coffee at Figaro? Last Saturday (June 5), Figaro Tomas Morato invited some of us bloggers to try out their delectable dishes and desserts. Let's first look at their new baby called the All-Day Breakfast. All priced at Php175 per plate and comes with garlic rice, farm fried fresh eggs, tomato-cucumber salsa and an 8 oz. 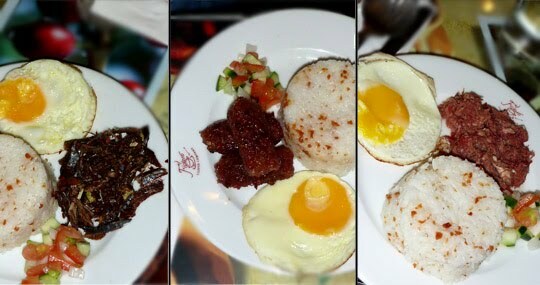 brewed coffee, the three options you can choose from are (from L-R of photo above) Gourmet Crispy Tuyo, Pork Longganisa, and Classic Corned Beef. If you want something salty and sauce-less, go with the Crispy Tuyo. The egg, rice, and tomato-cucumber salsa balances the saltiness of the tuyo, which makes it yummy and very Filipino-like. On the other hand, if you're salivating for something soft, kinda sweet and tasty, the Pork Longganisa is definitely for you. It's actually my favorite among the three. And lastly, the Corned Beef meal is still corned beef - nothing special about it really. Unfortunately, you cannot exchange the brewed coffee for another drink when you order any of the the All-Day Breakfast. What you see above is the Figaro A La Carte selection. 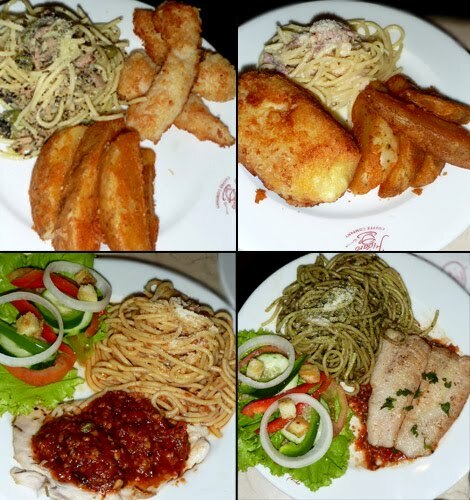 The first two are the Breaded Dory Fillet and Chicken a la Kiev -- both priced at Php229, served with mojos and 12 oz. of Iced Tea or Iced Coffee. In addition, the last two dishes in the lower portion of the photo above are the Tuscan Chicken and Dory Provencal for Php199, which is served with a salad side dish and a 12 oz. Iced Tea or Iced Coffee. Don't be limited by the pictures you see in the menu. You can enjoy each of these dishes together with a pasta of your choice (Arrabbiata, Al Tonno, Carbonara, Classic Chorizo or Pesto), so basically it's a mix and match kind of thing. All four dishes tasted very well, but the Breaded Dory Fillet is on top of my list. I personally find Chicken a la Kiev very affordable for being heavy and satisfying at a low cost. Saving the last part for the sweet tooth, we move on to the desserts. What you see above is the Dark Chocolate Raspberry Symphony (Php120), Mediterranean Strawberry Cheesecake (Php125), and Belgian Toffee Caramel Delight (Php70). I am not really a chocolate lover, so I'll beg off in commenting on the two desserts. On the contrary, I am a strawberry lover and I was not disappointed, even surprised, at how the cheesecake tasted. I loved every bit of it and will definitely get one when I go back. There you have it, I have just showed you why Figaro is more than just a coffee shop. Don't forget to visit the many branches available in your area.